The ProFTP mod_vroot module was not required in previous Ubuntu versions. When I upgraded to Ubuntu Server 12.04 LTS, it was displaying an error because the mod_vroot was not installed. To fix the problem, I just needed to open the Terminal and install the ProFTP mod_vroot module. In case you are wondering, the mod_vroot module implements a virtual chroot capability that does not require root privileges. The mod_vroot module provides this capability by using ProFTPD’s FS API. It also allows one to map a directory out of the user chroot as an alias in the chroot for sharing common directories. In case, you have the same issue, this is an easy fix. 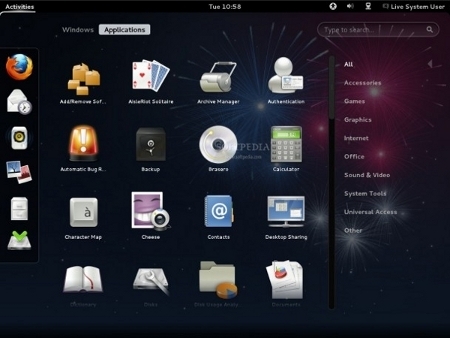 Fedora 17 also known as “Beefy Miracle” is a collection of software and an operating system based on the Linux kernel. Some of the highlights of Fedora 17 are: GNOME 3.4 and KDE 4.8, OpenStack, Eucalyptus and Open Nebula, ICC profiles for color printing and an improved gimp, and virtualization improvements. 64 bit is now the default when downloading Fedora 17. If you want to download the 32 bit version, you can still do so by clicking the “more download options.” The minimum RAM requirement to run Fedora is 768MB in text mode, and 1GB RAM with a graphical environment. In addition, you will also need at least 9GB of disk space. If you’re looking for a perfect desktop installation based on Linux Mint 13 “Maya”, check out the installation instructions at How To Forge “Linux Tutorials.” You’ll find detailed instructions how to install Linux Mint 13 along with screenshots. The list of applications is comprehensive. Give it a try.